Cosmetic and Plastic Surgery Tourism. At Makeover Travel we are specialists in the repair to cases of Cosmetic Surgery that have been performed in other centres and have resulted in being deficient or unsatisfactory. This is one of the exclusive products you will only find at Makeover Travel, thanks to the high professional level of our Plastic Surgeons. Medicine and Surgery are not exact sciences, and therefore contain a degree of variability and unpredictability. In part, this is due to the human factor, thanks to which Cosmetic Surgery at Makeover Travel is offered at the highest degree of professionalism. However, this same human factor, if it lacks the correct level of excellence, can be the cause of inadequate or complicated results. Separately, there are the individual and genetic factors corresponding to each patient, that may condition the work performed by the professionals. Currently, Cosmetic Surgery is a massive phenomenon that has been popularised and has penetrated all social levels. Whether due to the factors inherent in each patient or, what is more customary, through errors in the indication or execution of treatment, from the vast number of operations performed certain patients may be frustrated in their desire for improvement. The situation for patients suffering from poor results in their treatments is, at times, desperate, because they cannot find Specialists who are sufficiently honest or who have enough experience in this type of re-operations. It is not about applying customary and normal techniques of Cosmetic Surgery. Cases of secondary surgery require a meticulous and personalised study by professionals especially dedicated to these types of repair. The techniques applied have to be designed to measure for the condition of the tissue. Our medical team provide a great wealth of experience in secondary surgery or for the revision of those cases that have already been operated on and in which the patient wishes to improve the result. These situations are very demanding professionally and only certain Specialists can meet them with due guarantees. We assess you in a totally independent and professional manner, we shall inform you of the real possibilities of improving your result, and we shall try to achieve the success so desired from the previous treatments. At Makeover Travel we shall know how to listen to you and to understand what you are looking for. Thanks to our Plastic Surgeons many patients have recovered their belief in Plastic Surgery and the joy of living. With any cosmetic surgery, a touch-up or revision procedure is sometimes necessary. Even in the hands of the best surgeon, the need for revision sometimes occurs. And because rhinoplasty is a complex operation, it has a higher revision rate than other cosmetic procedures. Revision rhinoplasty is a surgical procedure designed to repair both form and function of a nose that has previously been operated on. Many people have difficult breathing from their nose or are dissatisfied with the cosmetic appearance of their nose as a result of prior nasal surgery. In fact, many patients have had several unsuccessful nasal surgeries, even as many as six or seven prior procedures. Because rhinoplasty is one of the most difficult of all plastic surgery procedures, there is a large need for secondary surgeries. Further, revision rhinoplasty tends to be an even more complicated procedure than primary rhinoplasty, making it essential that patients find a sufficiently qualified and experienced surgeon. 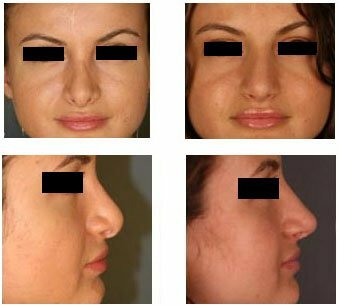 Good candidates for revision rhinoplasty include physically healthy men and women who are realistic in their expectations and are unhappy with the results of a prior rhinoplasty procedure. In our plastic surgeons' practice, about 40% of the rhinoplasties they perform are revision rhinoplasty cases from patients who had operations elsewhere by another surgeon. The most common thing these patients say is they did not realize at the time of their first operation that not all plastic surgeons specialize in rhinoplasty or facial surgery. If your first surgeon specializes in whole body plastic surgery, chances are his/her practice does not specialize in nose surgery. Rhinoplasty may not be the most common procedure performed in their practice. Unfortunately, most people seeking revision surgery realize this after a bad outcome. Like any other cosmetic surgery, rhinoplasty is not an exact science and some irregularities may appear after rhinoplasty surgery. Rhinoplasty surgery, as opposed to all other cosmetic surgeries, is by far the most challenging surgery. No two noses are alike, each surgeon's sense of aesthetics is different and the surgery is performed differently by each surgeon. Even if the surgeon does everything within his/her power to do the operation as well as he can, he cannot control how the body heals postoperatively. It may seem that nobody would want to have rhinoplasty surgery to start with. In reality, if you have real expectations about plastic surgery, the majority of outcomes are positive and most people will not require additional plastic surgery. But let’s focus on the small percentage of patients who did not get the outcome they wanted. How and why does this happen? Patient expectations are very important. No one’s nose, or face for that matter, is perfectly symmetric. 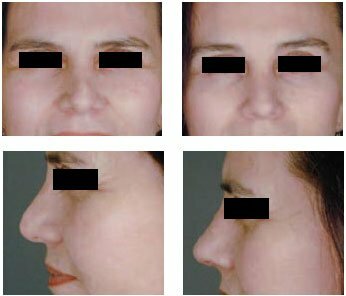 Therefore, it is important to understand that minor asymmetries are present prior rhinoplasty surgery, so asymmetries will be present afterward as well. Some patients may not be able to accept minor imperfections after surgery because of the idea that results after surgery should be “perfect.” Remember, there is no perfection when it comes to surgery; it is merely an improvement. Your nose was not perfect before rhinoplasty surgery and will not be after either. There are other common reasons why one might seek revision rhinoplasty. Callous or bump: A small callous or bump may appear on the dorsum up to one year following your procedure. The cause of this is unknown, but if it occurs, it can usually be removed in a minor procedure. Polly beak: Sometimes called a "parrot beak," this can occur when a hump on the bridge of the nose isn't sufficiently reduced in the area just behind the tip or when there's a build-up of scar tissue. Correction requires revision rhinoplasty. Pinched tip: When the tip of the nose appears pinched, it's often because too much tip cartilage was removed or the cartilage didn't heal well and collapsed. To correct this, cartilage is usually added to the nasal tip in a revision rhinoplasty procedure. Inverted V: When a hump is reduced, sometimes the middle vault of the nose collapses inward, causing an "inverted V" appearance. This may be corrected with the placement of grafts in a revision rhinoplasty procedure. Post-operative changes: In general, following primary rhinoplasty, the nose changes every year. These changes can be unpredictable, and you may not like the way these changes look. Disappointment with results: Despite your surgeon's best efforts, it's possible that you may be disappointed with your results. Disappointment may be due to unrealistic expectations on your part, unclear communication of your goals, surgical aesthetic misjudgment, or complications during the healing process. Even if you're completely satisfied with the way your nose looks following surgery, it is possible to experience a nasal obstruction that make it more difficult to breathe through your nose. Most nasal obstructions can be corrected with revision rhinoplasty. If your breathing is hindered in any way, you may want to consult with your surgeon about a follow-up procedure to alleviate the problem. No plastic surgeon will get a perfect result. If your surgeon tells you that he never performs revision rhinoplasty on his own patients because they all turn out great, say thank you for the consultation and leave the office. All rhinoplasty surgeons at one time or another must perform Revision Rhinoplasty surgery on their patients because rhinoplasty surgery and the postoperative healing are not completely 100 % predictable processes. The real question then becomes: What percentage of Revision Rhinoplasty surgery does each surgeon perform in his own patients? And, what are the problems needing Revision Rhinoplasty surgery? The acceptable rate, in our opinion, for patients requiring Revision Rhinoplasty should be about 5%. The type of problems requiring Revision Rhinoplasty surgery performed by each plastic surgeon is also important. Not all revisions are the same. Revision Rhinoplasty surgeries in one doctor's practice may imply coping with minor problems after healing. While in someone else's practice, it may mean returning to correct plainly unacceptable results after the first surgery. It is true that we cannot control all aspects of the surgery, but the way the surgery is performed, the level of expertise of your plastic surgeon in the field of Revision Rhinoplasty, the type of training and the number of nose surgeries he does will have a significant influence in the outcome of the procedure. Stated simply: You cannot control all aspects of the surgery and the healing accompanied with it, but you can control who you choose to do your surgery. From all controllable aspects in rhinoplasty, choosing the right plastic surgeon is probably the most important factor in achieving a desirable outcome. So, should you have another surgery? Who should do your surgery? And when is it appropriate to have it? As discussed earlier, no plastic surgeon gets perfect results all the time. The first issue you must address is whether the problem needing repair is minor or an unpredictable result after the surgery was performed properly by your surgeon. If this is the case, the first surgeon likely will be able to take care of it. On the other hand, if the result of the first surgery is plainly unacceptable and you just realized that your plastic surgeon's practice doesn’t really specialize in rhinoplasty surgery, it is not in your best interest to have the same surgeon correct the first surgery. Chances are your doctor is not equipped to perform the revision surgery required. Just as he did not get it correct the first time, he/she will not get it right the second time. In fact a bigger problem may be waiting for you. Emotionally this is very difficult. You just invested energy, time and money on a procedure that had an unacceptable outcome (assuming your expectations were realistic before and after surgery). The last thing you feel like doing is paying for another surgery. Having a second surgery by the same surgeon to repair the problem at no charge now sounds very appealing. What you do not realize is that you have a very high probability of having a second bad outcome. A second bad outcome will result in even more emotional distress to you and more damage to your nose, which will be even more difficult and expensive to repair. It is hard to make the decision to pay someone else for a second surgery. But, before you commit to revision surgery by the first surgeon, get a second opinion by someone who specializes in rhinoplasty to weigh all options. Timing of surgery is also very important. Several months after surgery swelling may still bother you, and no treatment may be needed. Conversely, problems that are not evident several months after surgery may only be visible a year later when swelling fully subsides. I know it is very difficult emotionally to wait for resolution of your concerns, but be patient. 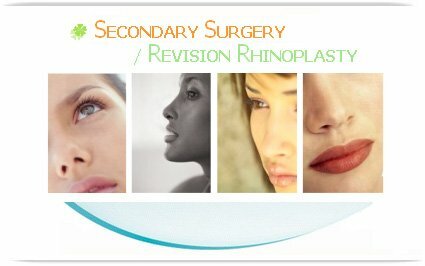 Why is Revision Rhinoplasty So Difficult? During revision surgery, the surgeon usually encounters scar tissue inside the nose. It is very difficult and time consuming to operate with scar tissue. Also during this surgery, the surgeon typically must “undo” what the previous surgeon did and then “redo” an entire operation. This is a reason revision rhinoplasty will take up to four times as long as a primary nose surgery. Here’s another thing to consider. In most revision surgery cases the nose’s skeletal support has been overly weakened from excessive removal of cartilage and bone. Thus, the support and breathing function must be rebuilt at the same time as the cosmetic aspect is addressed. If your first surgery was less than satisfactory, chances are that in the right hands you will achieve a very good result with revision rhinoplasty. Just like with primary rhinoplasty, you must have realistic expectations about what the surgeon can and cannot do. Expect improvements, not perfection. Remember, during the second surgery your nose may have large amounts of scar tissue that makes it more difficult to manage during surgery and creates even less predictable results than the first time. Consequently, it is important to have the surgery done by someone who specializes in revision surgery; someone who is accustomed to dealing with scar tissue and who can maximize your chances of a good outcome. Are You Emotionally Prepared For Revision Rhinoplasty? If you had a less-than-ideal outcome from your first procedure and you will require further surgery, do not rush into it. You must be ready emotionally t deal with another operation and another recovery period. 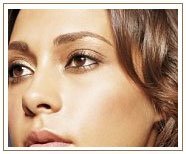 As mentioned before, revision rhinoplasty involves operating on scar tissue. Scar tissue will take even longer to heal as compared to normal tissue. It may take your nose twice as long to recover from swelling as compared to your first surgery. The resolution of swelling associated with surgery is a continuous and slow process. Your nose should look better after surgery, but it will not have its definition or desired shape for many months. You must prepare yourself to accept small incremental improvements on the appearance of your nose as the months go by, rather than expect to be fully healed after several weeks. Revision rhinoplasty is a highly skilled surgery and is very time consuming. It may take two or three times the length of time required for a first-time surgery. Revision rhinoplasty can be done successfully if done properly. Make sure you choose the right doctor, have realistic expectations and are emotionally ready to have another surgery. Cosmetic Surgery tourism (also known as Medical Tourism or Health Tourism), the act of traveling abroad to obtain cosmetic or plastic surgery, has emerged in recent years as a major new trend in the global healthcare industry, as residents of the United States, Canada, and Europe seek out affordable and high quality healthcare mainly in Latin America (for plastic and cosmetic surgery) or Asia (for medical surgery). Cosmetic Surgery tourism procedure prices vary from medical provider to medical provider and can even vary within the same country based on a medical provider’s reputation, facilities and patient volume. A general rule of thumb is to expect a price savings of 50 to 75 percent off of the cost of medical procedures done in the USA or Europe. Healthcare in the United States and Europe is exorbitantly expensive. Each year millions find themselves unable to pay for the health care they need because they are either uninsured, uninsurable or underinsured. Over 40 million Americans have no health insurance at all, and millions more are forced to forgo 'elective procedures' that do not qualify for coverage by insurers. An estimated 120 million Americans live without any form of dental insurance. The resultant system is one that has left many Americans painfully vulnerable to sudden, unexpected, and overwhelming medical and dental expenses. A recent study describes fifty-percent of bankruptcies in 2001 as being related to medical crises*, and each year millions of Americans are forced to choose between incurring crushing debt or foregoing medical procedures. Medical tourism, finding safe, affordable and high quality healthcare abroad, is the logical - one might say inevitable - outcome of this state of affairs. Cosmetic Surgery tourism is not a completely new phenomenon. For years, savvy travelers have gone abroad to a select group of Cosmetic Surgery tourism providers around the globe for medical, dental, cosmetic and surgical procedures, seeking and finding significant cost savings without sacrificing high quality healthcare. In recent years, however, both international healthcare providers and national governments have taken increasing notice of this growing source of income and begun to formally plan and develop medical tourism infrastructures to cater to and support Cosmetic Surgery tourism and health tourism.